The great thing about Facebook is It’s easy to use from any handheld device or computer. It’s also easy to share videos, pictures and live video broadcasting. If you’re looking to buy an X1/9 or trying to find parts for your project, then this group is one of the best global resources you could be part of. With members and suppliers from around the world on this group, you&apos;re bound to find what you&apos;re after. Often enthusiast will sell their X1/9’s privately to another enthusiast via this Facebook group. Good X1/9’s will sell within 48 hours, well before you would even see it advertised on Gumtree or Carsales. If you&apos;re one of these people that don&apos;t do Facebook, I would suggest reconsidering as there is no other resource of information like it in the world. You would only be crippling yourself by not having access to this resource. So if you need help or have questions please ask via Facebook, not email. 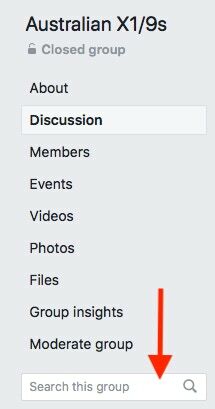 Read here if you’re having problems joining the Facebook group. You may find you’re not getting accepted to the group. This can happen for a few reasons. 2. Your profile is very new, or you used a strange name not your own. 3. You have an excessive number of friends or you’re a member of excessive groups. Security for members is important, so we avoid allowing a strange profile to join the group as they tend to join for the wrong reasons or a BOT’s collecting data. If you are having problems, please make contact by clicking here. Facebook did have a great marketplace however it has become hard to find and use now within the group. So the best way to find an X1/9 listed is copying the VIN from the website. Then within the X1/9 Australia Facebook group paste the VIN. You will see all the past and current adverts come up.